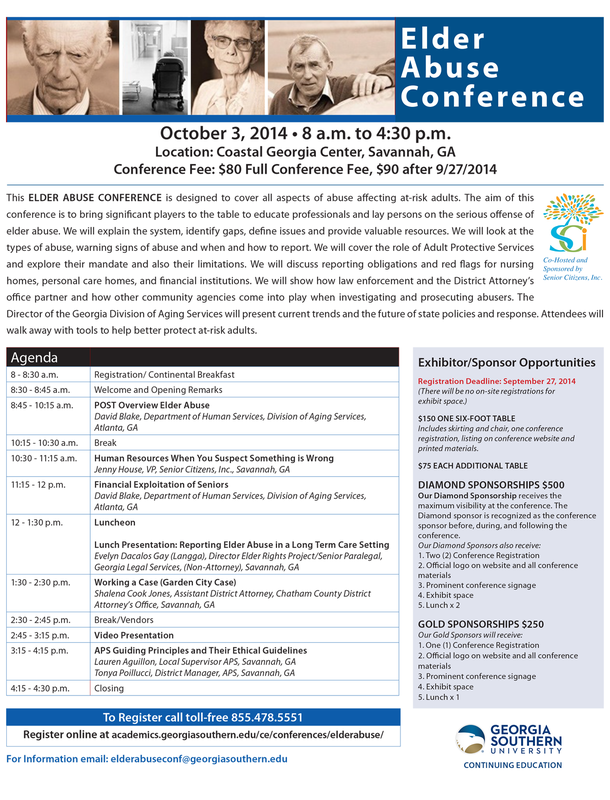 October 3, 2014 8 a.m. to 4:30 p.m.
ElderAbuse-SCIlogoThis elder abuse conference is designed to cover all aspects of abuse affecting at-risk adults. The aim of this conference is to bring significant players to the table to educate professionals and lay persons on the serious offense of elder abuse. We will explain the system, identify gaps, define issues and provide valuable resources. We will look at the types of abuse, warning signs of abuse and when and how to report. We will cover the role of Adult Protective Services and explore their mandate and also their limitations. We will discuss reporting obligations and red flags for nursing homes, personal care homes, and financial institutions. We will show how law enforcement and the District Attorney’s office partner and how other community agencies come into play when investigating and prosecuting abusers. Attendees will walk away with tools to help better protect at-risk adults. Co-Hosted and Sponsored by Senior Citizens, Inc.